After breast cancer, a person may experience psychological or emotional difficulties due to altered body image, and a swollen limb can exacerbate this. Research suggests that survivors with lymphoedema are more likely to suffer psychological and emotional difficulties, be more disabled, and experience a poorer quality of life than survivors without the condition. Improved breast cancer survival rates suggest that approximately 2:3 women survive the disease beyond 20 years. This means that more people are living longer with this debilitating side effect for which there is currently no cure. 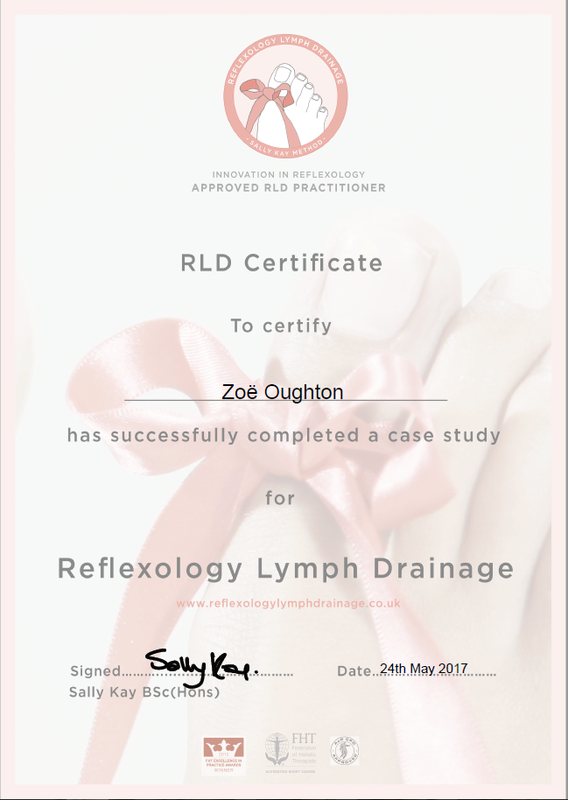 RLD is an award winning reflexology technique which focuses on stimulating the lymphatic reflexes on the feet through a massaging technique. The aim is to cause an effect on the lymphatic system in the body. It is a unique sequence that has been researched and developed by Sally Kay BSc(Hons), whilst working in Cancer Care. The results appear to support the theory of reflexology. Breast Cancer is the most common cancer in the UK. According to Cancer Research UK (2011), the lifetime risk of developing it in the UK is 1:8 for women and 1:1014 for men. Approximately 20% of these patients develop secondary lymphoedema of the arm following treatment for breast cancer. RLD was developed through clinical practice while working in cancer care outpatient clinics, using reflexology for patients suffering from all kinds of cancers at all stages of the disease. Many of the patients had been treated for breast cancer and consequently suffered secondary lymphoedema. Complaints relating to lymphoedema often included, a swollen arm, painful shoulder, uncomfortable underarm swelling, weakness and problems with everyday living activities. In the summertime, patients found the support sleeve uncomfortable in the heat as well as unsightly and it was often described as “a label”, and “a constant reminder”.